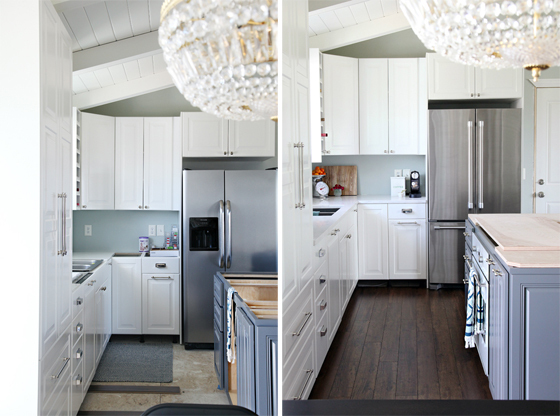 IHeart Organizing: IHeart Kitchen Reno: Four Weeks Later! 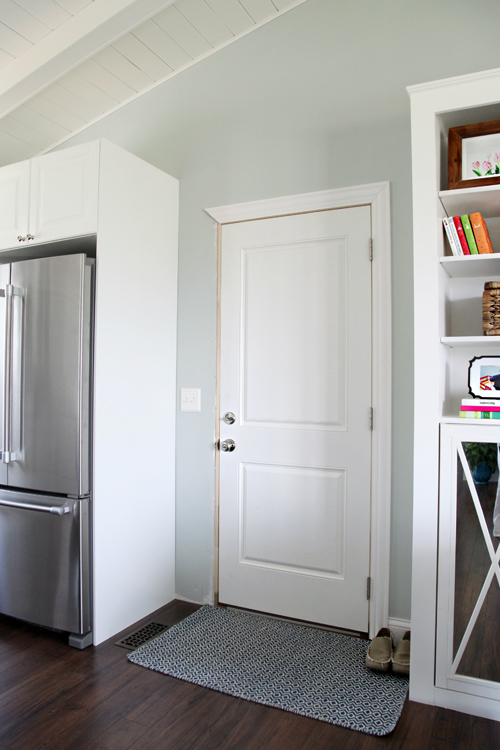 104 IHeart Kitchen Reno: Four Weeks Later! Wow! Another month has come and gone since our previous kitchen update. I was really hoping that we would be able to wrangle both kitchen and living room projects and updates all at once, but the living room sort of took over at the end, both on the blog and in our lives. After the last update, I had a few questions I will be chatting through today, and I will also be sharing a few big things that have happened over the past few weeks. Although we were so focused on the living room side, there are quite a few changes here as well. It is finally starting to look and act more like the space we have been working for! Based on the photo above, I am guessing there are a few differences that stand out from the last update. We installed and set the island as soon as we could, which allowed us to finish installing our flooring. That was a major game changer. Like wow. It really unified our entire kitchen and living area and added so much more warmth in contrast to all of the white. And it is so clean! Looking back at the last post, my photos seemed to have a blue hue which was throwing some you off. I totally get it, I just revisited the photos and they are pretty bad. My guess is that much of it had to do with the cloudy day paired with reflections bouncing off of all of the white. Not really sure. The picture above is a much truer photo of how our kitchen really reads, especially now that the floors ground things a bit more (floor installation post coming soon). Some of you asked about measurements... We currently have about 3 1/2 feet between the outer cabinets and island. We always read that between three and four feet is best, and we have been really happy with the amount of room and flow that the 3 1/2' provides. We are able to easily navigate around the dishwasher when it is completely pulled out for unloading, and the refrigerator has plenty of room to open and get around without any crowding (more on that in a minute). When coming up with a kitchen design, we were extremely limited with where we could place our oven and stove. Our fridge and pantry had to go on the outer walls, and with the window and plumbing on the outer walls as well, we had no other choice than to place our cooking pieces in the island. In the end, I am happy it worked out this way as we will be able to face the living area while we cook (great for watching the fam and television). We also had to go with a larger island to accommodate the oven, cooktop and downdraft without compromising countertop work surface space and to provide enough distance between the cooktop and stools on the opposite side. This allowed us to add a lot more storage in the island, so it all worked out in the end. Plus, I got the oven I was lusting after for a couple of years! It is a beautiful white glass option which was originally purchased from IKEA (and was discontinued when they released their new kitchen line). 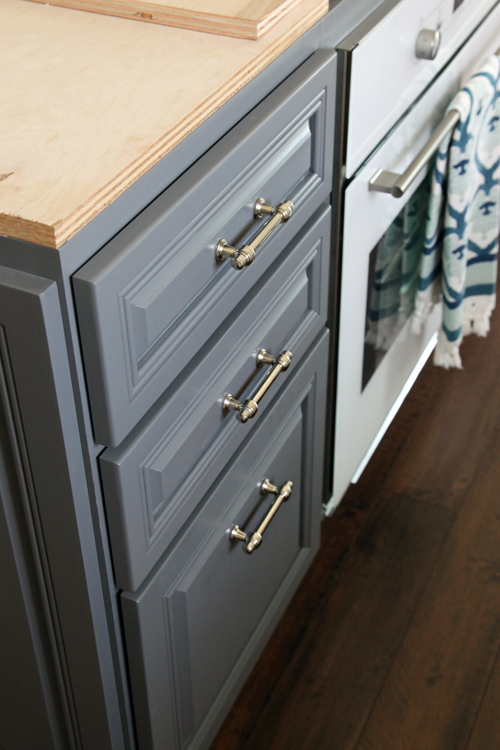 As you can see, we also installed the remainder of the hardware on the island cabinets to match the rest of the kitchen. I also received a couple questions and emails regarding the island details. The doors are full overlay, meaning that there is very little cabinet frame showing around each door and drawer front. 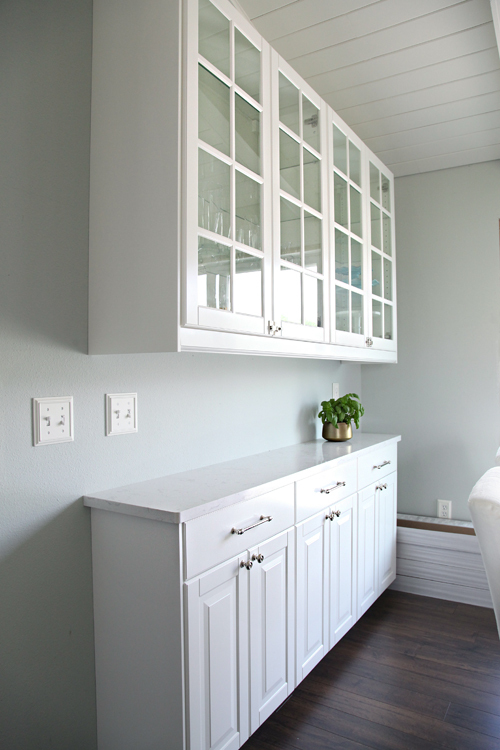 It creates more of a seamless appearance and is also quite similar to our IKEA white cabinets across the way. 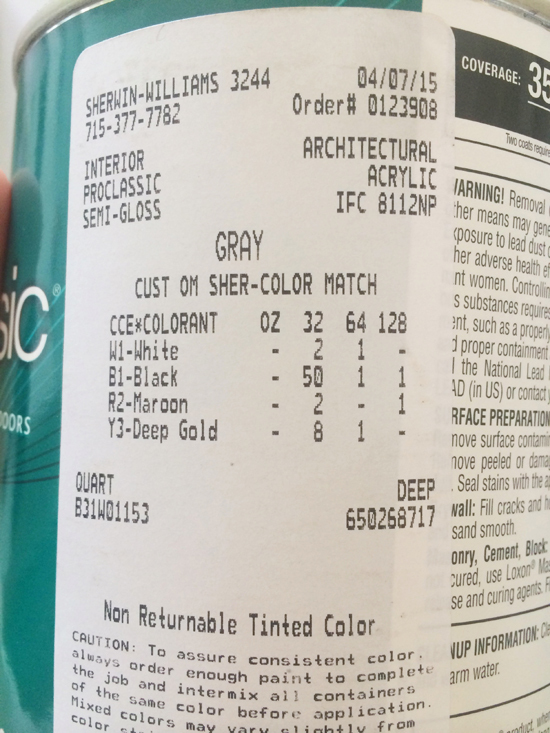 The color is an option offered by the cabinet company that built the pieces, so I don't have a specific name or number (other than a generic Slate), but I did have it color matched at Sherwin Williams and you can see the code here. It is a beautiful color in person, just extremely challenging to photograph because it reads a bit differently depending on how the light hits it (as illustrated between the photos above and below). You may also have noticed that we only have about half of our counters installed. They always say to prepare for the worse when it comes to major home renovations, and we have experienced a few different hiccups along the way. I think it is just important to know that a few things will go wrong at some point, and do your best not to turn into a Kitchenzilla when they do. You have heard about our dishwasher saga and maybe also read about our first refrigerator being delivered damaged. Both were no big deal in my eyes. Truly nothing to get upset about and maybe they simply prepared us for the next uh-oh. The day the beautiful counters arrived to be installed, we went to place our oven into the oven cavity of the custom cabinets. Guess what guys! It didn't fit. Um, what? The cabinet was built to the dimension of the appliances we had already purchased. They were able to install the outer counters and sink while they were here, and now that we have since been able to figure out the cabinet situation and set our oven, will be coming back next week to finish things up (counters can typically be set without the oven installed, but we didn't know if our island would need to be taken apart or changed so we opted to wait it out). As frustrating as the cabinet situation was (it caused a three week delay in the island counter install), the counters are about the most beautiful moment this entire renovation has seen yet. When we first built our home, I selected green faux marble laminate counters because I was 19 years old and thought they were so cool and grown up (ha). It only took me about four months to no longer like them. For the next 13+ years, I was left trying to work with something that I didn't love. 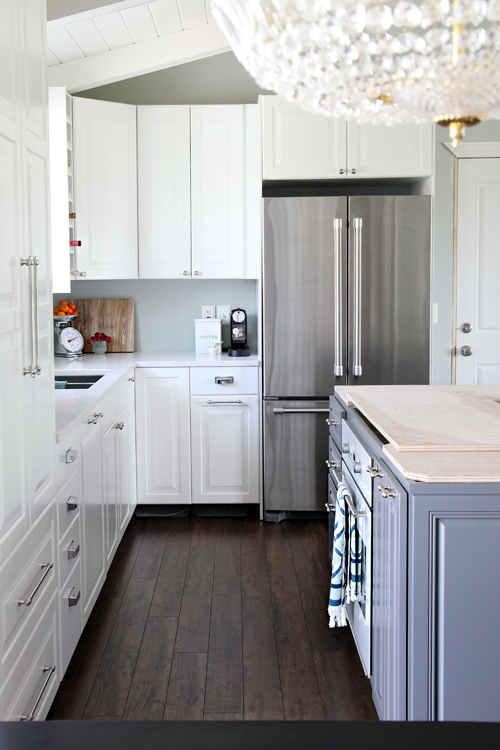 I am pretty positive that experience has scarred me, and may be why a lot of our newer kitchen finishes and selections are a bit more neutral and classic. Being this is such an investment, we don't want to change things each time a trend comes and goes. And we don't want to have regrets four months from now (although, I am sure there will still be a few lessons learned). 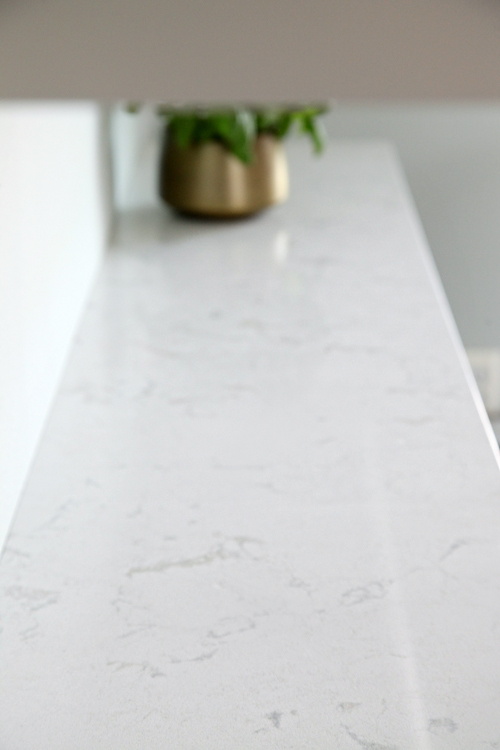 Just like a lot of the other decisions we have made in the space, we did a lot of reading online when selecting the types of countertops to install. Ultimately, quartz won out. Both durability and the fact that it is non-porous (which means it won't harbor bacteria), were the main reasons we selected quartz. I don't think we will regret these counters four months or even ten years from now. They are Cambria in Torquay finish and another thing I am smitten with is that they are manufactured right in Minnesota. 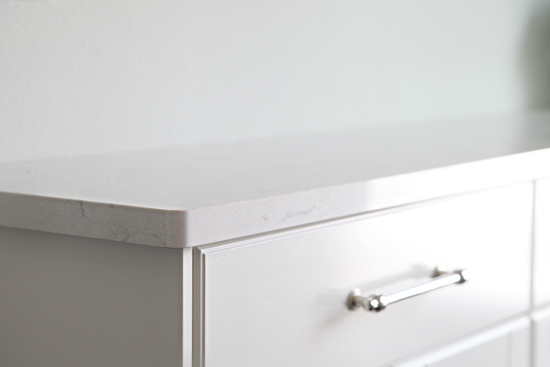 (For local readers, we shopped around and ultimately decided to purchase from Selective Countertops and we couldn't be happier with the results). The veining and colors are a mix of beiges and grays and are quite subtle, almost a marble-like result but in a much more kitchen friendly finish. We also ordered our sink with the counters, and once again, a major difference has been made in how we use the kitchen. But little did I know it would also be amazing for hiding a pile of dirty dishes when the dishwasher is full/being ran. Definitely a jumbo sized bonus in an open concept layout. Another new-to-us feature is a pull out faucet. The kids and I have been having fun with this! 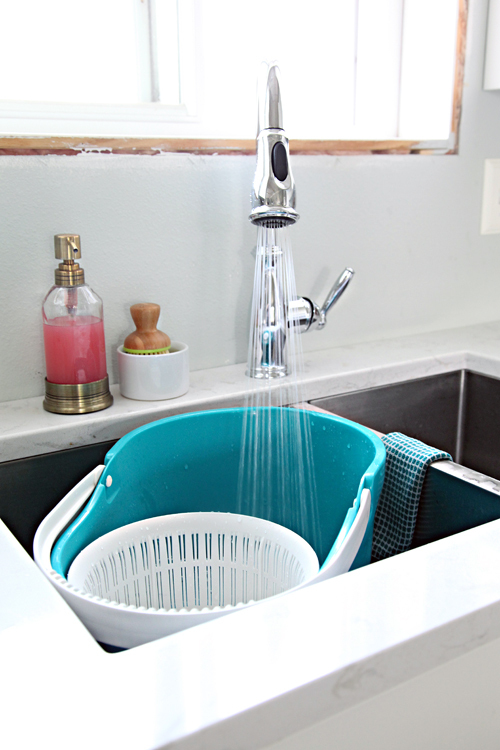 It reaches all corners of the sink which is great for cleaning, and offers two spray options. We purchased a model that complimented the cabinet hardware, not super modern but not overly ornate either; it was juuuuust right. But wait, there is more! I had no idea how much really has changed in the last month. Big post today folks. One thing I have been challenged with throughout the entire process, is knowing that we have a garage door to work around. And it was a previously very unsightly door with about eight different layers of paint and dings and dents. Although not an ideal setup, moving the door really wasn't an option as there is other place to move it to. Keep in mind that we really only use the garage for projects, and even when we start parking in there again, we will most likely be carrying in a handbag and groceries. The boys always come off of the bus and enter through our front door, which is why their belongings are all located there. So fortunately, we don't need much of a system for more than a pair or two of shoes, maybe keys and some hooks. But visually, oy! Our solution was to build the fireplace built-ins in the living room, to mimic the cabinets in the kitchen. Once the moulding is installed on the kitchen cabinets, they will be the same height and color as the built-ins, as well as the same distance on either side of the door. Our very lovely new paneled door! See how we only trimmed the living room side? Haha, darn One Room Challenge. And no, we weren't really that lazy, we only purchased enough to do the living room side and that is exactly where we ran out. Hoping to get the rest finished up in the next week or two. Just sort of funny how that worked out. Anyway, still not the most amazing setup, but I love how it worked out to create more of a nook or alcove for the door, making it almost look like intentional placement. And the paneled look on the door is much more polished and matches the remainder of our interior doors. Definitely happy with how it all is turning out. Last but not least, we finally have a fridge! It is counter depth, and also finally framed out. Or in? Whichever way, it is so much cleaner. When we began the kitchen planning process, we realized quickly that to maximize our space and to accommodate the island with cooking appliances, that our fridge would be best at a countertop depth. First, I ordered a white side-by-side option. There are not a lot of white countertop depth refrigerators on the market, especially with great reviews and decorative bar pulls. And the ones that did have good reviews, were about a few thousand dollars over our budget. But I found one and ordered it and when it arrived, it was completely dinged and dented and the pulls were nothing like they were pictured online. The company took back the refrigerator at no charge, and we were left starting over with our search. We thought that a side by side was the way to go since that was what we were use to, but after quite a few recommendations to try out the french door option, that is what we ultimately landed on. I have to say, I love how much more space there is in this style and that the doors can swing wide open and leave us a ton of room to navigate, even with the island directly behind us (we purchased this model). What I don't love is the freezer drawer. This thing terrifies me. But I always love a good organizational challenge so I will let you know if I ever get this thing figured out. We also kept our previous fridge in our garage as a replacement to our freezer chest, which we will love for holding six packs of be... I mean soda. And for party throwing and entertaining and freezer overflow. Also, for some reason my regular stainless cleaning solution does not work on this fridge, so I would love recommendations on streak-free stainless cleaning. So, a month later we have a fully functioning sink and fridge and even started unloading (but not organizing) our fridge and cabinets. After the counters are in next week, we can have our stovetop hooked up and start cooking on real appliances again! If anything, this process has given us a much deeper appreciation for everyday kitchen conveniences. Like making coffee. And just when I am feeling like the end is near, it is time to get real and take a look at what is left before we call this renovation complete. I can't wait for layering in finishing touches to really start warming up the space. Things like rugs and new dining chairs and window panels, oh my. And cutting boards. We still have a lot of items to pick-out that we haven't landed on yet like backsplash (although my heart is set on one) and also have to troubleshoot a moulding issue we may run into with the beams and cabinets. But everything left is really just a lot of finishing touches at this point! And after next week, it should at least be 100% functional (fingers crossed). With that big list lingering above, I think you know where you will be able to find us when we aren't at the baseball fields. Happy weekend everyone! You can follow all of the kitchen progress here. Your kitchen is absolutely gorgeous. I love everything. As soon as I saw the countertops, I knew exactly what they were! We're buying a new house and gutting the kitchen and I keep coming back to the option -- sooo expensive, but I love them. I kept going to the kitchen store and seeing different kitchens and every kitchen I liked had those. Good to see someone else loving them! Best of luck Kristi!! My biggest piece of advice is to take your time, read kitchen forums, prepare for the worst and be excited for the best! Yours will turn out great! The best stainless steel cleaner that I have ever used is Steel Meister. My mom recommended it and I found it at Home Depot. I comes in a spray bottle and lasts forever. My refrigerator is very similar to yours and Steel Meister works like a charm on it. Your kitchen looks beautiful, by the way! You will love having quartz counters with kids. They are the best! It is looking amazing so far! Such a huge difference from where you started a few months ago, and an even crazier transformation from where you started originally. I love the timeless, bright, and airy look. Keep the faith--the end is in sight! I love the Weiman stainless steel products and have recently discovered their wipes. Love them!! My grandmother taught me a great trick for stainless steel cleaning.... WD-40!! Spray on paper towel and in a circular motion clean. And Walla! You have shining stainless steel! Try it and let us know! I think we have some of that on hand, might have to test it out. Thanks for sharing! Yes, my mom does the WD40 trick as well. Everything is looking great!! Almost to the finish line. Try Weiman stainless steel wipes. I've found them at target and ace hardware. They're great for quick cleans of fingerprints. It looks amazing! And so pulled together with all the different elements! When you said 30" sink does that mean you went with the 30" sink base? Or did you have to go larger to accommodate the sink? We currently have a 30" base in our IKEA plans and I'm so impressed by the size of the sink - it looks huge! The sink is 30", I believe the base cabinet is 36". And it seems so big compared to our previous sink, I am such a fan of the difference. HI! I may have missed above but can you share where you got the sink and the brand?! That was my old solution also, but for some reason it isn't working so great on the new fridge... Seems to be a shinier, less forgiving finish. Love your kitchen Jenn! It's so bright and clean! This is definitely something I would do in kitchen reno. I use homemade Castille soap/ water/ lemon EO cleaner for my fridge, and it works great! Your whole kitchen looks amazing! Would you mind sharing the dimensions of the island? Thanks! Hi Ann - the island cabinets are a total of 48" deep by 70" wide. Once we add the counter with an overhang for seating, it will be about 6 feet wide by 5 feet deep. xoxo! So beautiful! Love everything about it. This is inspiring to me because one day we are going to renovate our kitchen and I am SO EXCITED!! I lived through a total remodel. It was NO fun, but totally worth it in the end. For cleaning my stainless steel appliances I use Pledge (furniture polish) and a soft cloth. It works great and no need for another cleaning product taking up space. Love the deep sink. 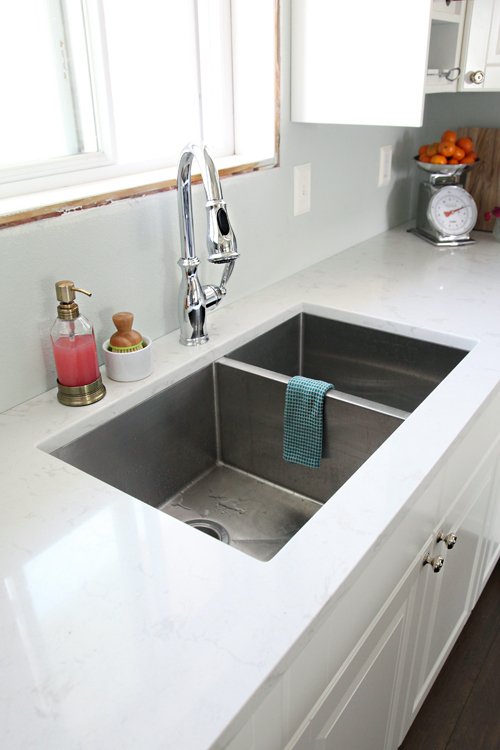 For cleaning my stainless steel sink I use baking soda and a damp cloth. I also use this for cleaning the insides and bottoms of my stainless steel pans. It cleans them up, again, with an existing household product. I use a drop or 2 of lemon oil on our stainless steel. Works like a charm and smells amazing! You should NOT clean with lemon oil or products with lemon if you have pets though, it is toxoc to dogs, cats and horses. I've never heard Jen speak of owning a horse, although mo she has room with that kitchen! well, maybe at least a mini one. But, please, take care to read labels if you have pets. Thanks Nicole! Although we don't have any mini horses running around, we do have pups! I will be sure to remember that when we finally select a cleaner. xo! Oh and although I haven't tried them yet, I did just find out about Ecloths, that clean using only water and have different cloths for different purposes. I'm really excited to tr them. As for the lemon oil, I found that out a few years ago when I switched to home made cleaners which then also led me to look at my pups food after some liver enzyme issues. They were eating a big "supposedly good" brand that had garlic in it...also bad for pups! 3M has a stainless steel cleaner - the best I have found. Its in a silver can and called stainless and chrome polisher. Also - please PLEASE let me know what you come up with for your freezer drawer! Mine is my nemesis! Love the progress! I have a question, there is a gap in the pantry doors. Is that something permanent or can it be fixed? I have the same issue with my ikea cabinet that I put in the bathroom. Hi Elie! Completely fixable, it's all in the Ikea hinges. They can be adjusted to move the cabinet doors in and out and up and down. xo! So inspiring! I wonder how to make the refrigerator looks like a cabinet. The cabinets we purchased from IKEA are designed to utilize two side panels on either side of the upper cabinet, which frames out the fridge. We installed the panels using simple L-Brackets. xoxo! Gorgeous! I am in love with this kitchen!! i love how it's all coming along! Can you tell me what brand your toaster is? Thank you Lynn! The toaster is a Waring 4 Slice (http://amzn.to/1FnQEQI). xo! Great post and pictures. Love the kitchen and the updates! Great ideas and inspiration. Love the color combinations and the simplicity with style. Good taste for decoration too. Always following your posts! Blessings Jennifer. 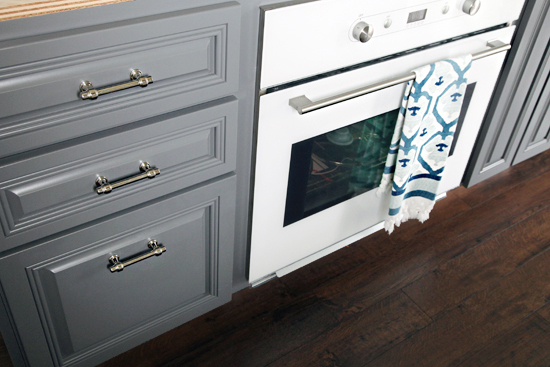 Love the new kitchen and was are starting to think about working on ours - could you let me know where you got the drawer pulls and knobs and the product name? Thanks! Hi Colleen! 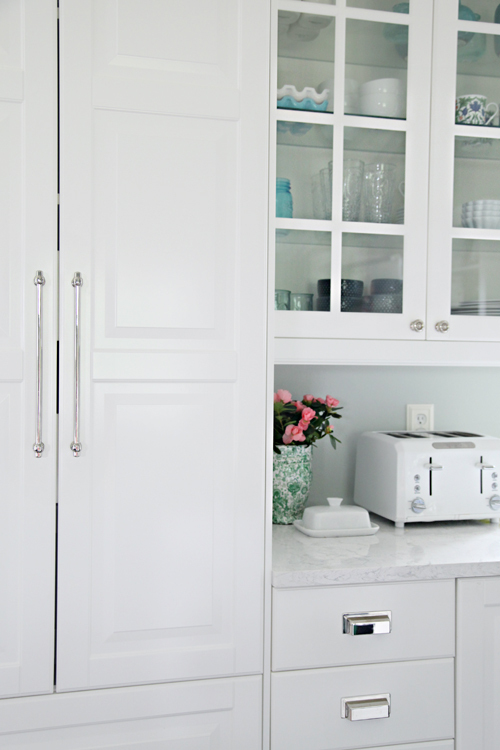 I shared the handle installation and sources in this post here: http://iheartorganizing.blogspot.com/2015/03/iheart-kitchen-reno-getting-handle-on.html xoxo! I love following your blog and projects. The kitchen looks amazing. I'm very inspired to upload color into our living room. Love everything about this space! The cabinets and hardware and the floor- just lovely. I have been slowly contemplating our kitchen remodel and what I want to do... so funny how our tastes change over time. Can't wait to read more here! This is such a gorgeous kitchen! Can't wait to see the final product! I especially love the floors and the countertops! Jen, your kitchen is so beautiful. Just an idea I had when looking at that door. If the lounge and kitchen cabinets are the same height you could "connect' the 2 via panelling over the wall at the side of the door each side as well as the top or better still install some narrow pigeon hole shelving at each side of the door so the cabinets basically never stop except for the actual door. Just something that popped into my mind here in South Africa!! Wow! Great transformation! It's coming out lovely. I showed these photos to my husband and he loves the laminate that you used in the kitchen/living area and the vinyl that you used in the bathroom. His question was what did you use as the transition between the vinyl in the bathroom and the laminate flooring (provided your new laminate runs throughout the hallway as well). Thanks! Jen, your kitchen is turning out beautifully! What toaster is that? I have been looking for a pretty white one. Thanks! Thank you Marlayna! The toaster is a Waring 4 Slice (http://amzn.to/1FnQEQI). xo! Your kitchen is so inspiring. I love the soap dispenser with the red dish soap -- I think that's what it is -- and the vegetable brush in the ceramic bowl. Can you tell us where to get them? Thank you Susan! The soap pump is from Target, I don't see it online any longer but have seen a similar style in the stores. Your kitchen is beautiful! Great job!! After trying different cleaners on our fridge my favorite thing to use is water. I use the same microfiber rags that you recommended in a previous post, wipe the fridge with water and follow up with a dry rag to buff it. It's cheap and easy to do. In fact it's now my 7 and 9 year olds job. One wipes and one drys! Hi Jen! Your kitchen is coming along so nice! I also used to always use vinegar for cleaning my stainless but it leaves my new ones sooo streaky! For a while I used the stainless wipes or spray from Home Depot. But found the chemicals to sometimes be over powering. (And I am by no means a chemical free cleaner! I love for Lysol wipes! Ha!) However I have discovered that the absolute best thing to make my appliances shine is just some olive oil on a cloth! They look brand new! And it's something I always have on hand! I still use my vinegar solution to clean them but then use the olive oil to get them shining like they are brandnew! Love what you are doing with the house. It takes time, but really gives me hope that over time, I can make some of those upgrades to my home, moving it from builder basic, to functionally perfect and dreamy for my family. Keep up the good work! Love the transformation! We are in the process of a full-gut kitchen remodel and right now everything is down to the studs from floor to ceiling. It's insane! But, we just picked the Cambria Torquay counter tops as well, and I'm so happy we did. Seeing your photos of them installed helps to make me feel even more confident about the choice. They are absolutely beautiful!! If you have time to answer, would you mind sharing the finish you picked on the edges? I really like it a lot and think it would be perfect for our project. And, Yay! for Minnesota!! A fellow MN reader here! Your kitchen thus far, GORGEOUS! I can't wait to see how you tackle your freezer since I have a similar fridge and my freezer is a disaster!!! 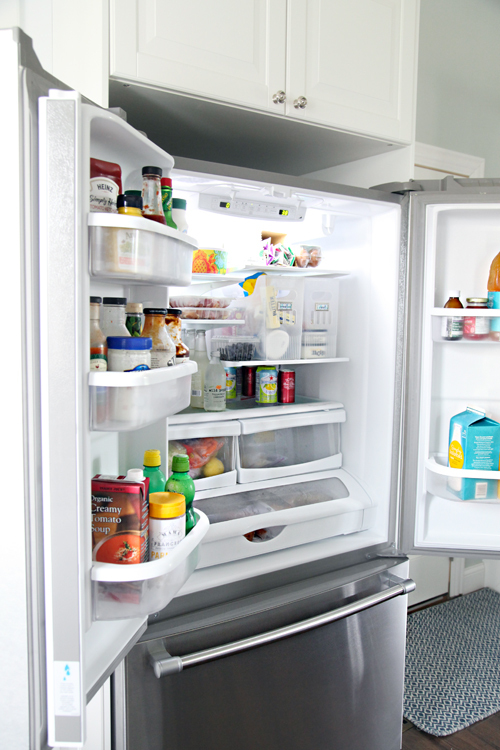 The one "negative" to the french door fridge is that they don't close as easy as a single door and it is much easier to leave them just the slightest bit ajar and spoil all your food. Ours does have an alarm that goes off if its left open too long but it is sooooo quiet you can barely hear it. Luckily I have good ears, but if it were to happen while I am gone, there is no way my husband will hear it. Haha. Funny that is makes complete sense yet I didn't think to try it! Off to give it a whirl now. Thank you! 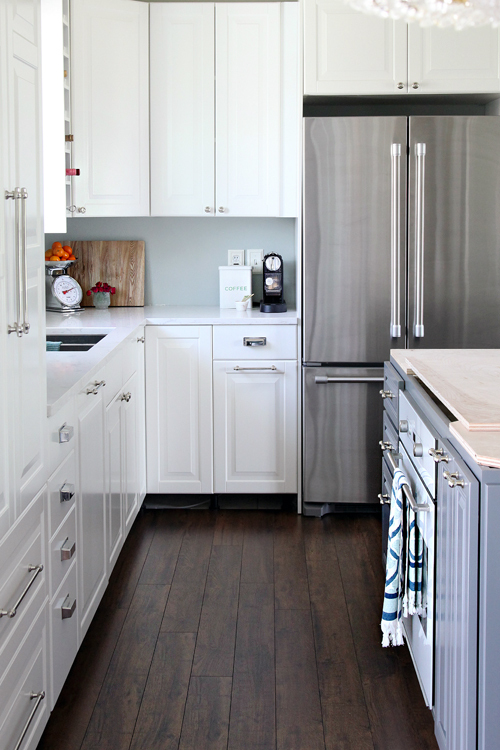 You will not regret buying the white quartz countertops. I bought ours in 2003 and they still look new after very heavy use. They will stain slightly but will clean with a mild bleach solution every once in a while. You will learn to love the bottom freezer and men love not having to stoop to dig around in the frig. I just keep stainless steel appliances and the sink and faucet smudge free and shining with a clean slightly damp microfiber cloth. Congrats on a beautiful new kitchen. Thanks Babs! Great to hear!! To clean glass and all shiny type surfaces I have found nothing better than Club soda. It amazes me how well stainless looks as well as my car windows, mirrors in my home look after using club soda. I just add a spray nozzle to a club soda bottle and I am ready to go. I also do the same with peroxide for countertops. Hope that helps you. Kitchen is absolutely amazing. Just loved watching the transformation unfold. I know this is crazy, but you know how sometimes you see an image and just fall in complete love with some part of it - the color combination, design element or just something, really, really speaks to you? The last picture in your post - the one with the green/white vase and pink flowers - COMPLETELY love that color combination. We're redoing our master bath and now I want to go with white/emerald/pink versus the cool blue/greys I had originally picked. If my hubs flips out I'm blaming it on you!! Not at all crazy Erica! My husband is all too familiar with this as well, I am always switching gears because of inspiration found. Although he doesn't understand, I am hoping he is starting to become use to it. ;) So happy you were able to find a color combo you are excited about! I love your kitchen! So gorgeous! We have a bottom drawer freezer and I only keep the daily essentials in there...ice cream, cold packs for lunches, yogurt tubes, etc. Everything else goes in our large garage freezer. We have a top drawer and a bottom drawer inside the freezer. The top drawer slides out and is shallow. To keep the bottom drawer organized, I use baskets and we have some built in dividers, which helps, too! Hope you can conquer your freezer! Beautiful! And you always have the best accessories! Where are those graphic kitchen towels from? Your kitchen is just perfect. The colors, the composition... EVERYTHING. I can't wait to build my own housse too. It's something I dream since I was very young! Absolutely stunning! I use Ava Anderson non toxic bathroom and hard surface cleaner. No streaks and non toxic to boot! Win win!! Hi Jen. To clean my fridge I use a microfiber cloth and plain old windex! I love your home, your blog and your organizing ideas. Thanks for sharing. Your kitchen is coming along so nice and fresh! I know having house spaces not complete can be overwhelming and unsettling. But your new kitchen/living/dining area will be so gorgeous! What pieces did you order for your glass cabinets on the wall and long buffet in your dining area? My husband and I are looking at ideas that was something we thought about doing ourselves. Ikea's website can be annoying at times so I was hoping you could share what pieces you ordered. Hi Heather! We ordered our cabinets before they switched to the new line, so I am having trouble locating the specific cabinets online. For the lower portion, we went with upper wall cabinets that we still rail mounted (and will add decorative feet to). They are a total of 30" tall by 24" wide by 13" deep and we did a total of three. The uppers are 39" tall by 36" wide and also 13" deep, using two cabinets side by side. The entire area is about six feet wide in total. Hopefully someone at IKEA can help you find exactly the pieces you need to do something similar with the new line. xoxo! Jen- you've got to get yourself a Norwex Enviro cloth and window cloth. 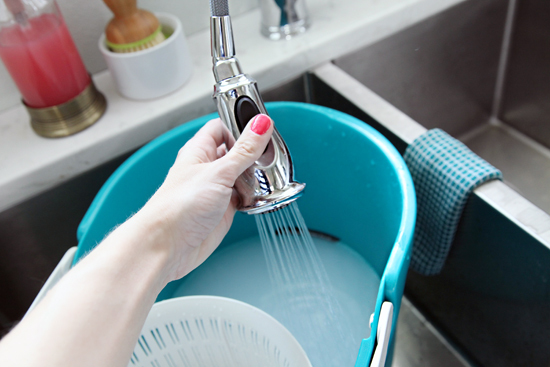 You'll be able to clean that stainless with just water. You tube it. I love mine! Also- I too am struggling with our new freezer drawer. I too will be looking for a solution, but when you find yours, share please! I LOVE your kitchen and your eye for color! You always pick out the most beautiful paint colors and have me running out to find those paint samples to keep on hand for any future projects. I have a few random questions... what are your thoughts on decorating above kitchen cabinets? I've always had decorations above, but I love how streamlined your kitchen looks without it. Is it a major NO? Where did you find your doormat and kitchen towel? I've been looking for those colors in these items and haven't found what I've been looking for. Thanks in advance- so appreciate your advice! Thank you so much! As far as decorating above cabinets goes, I have seen it done well and it can end up really lovely. I personally struggle with accessorizing and balancing decor with clutter, and I also know how dusty it can get up there, so I personally prefer to keep the uppers free of items. Looks gorgeous. We are planning a kitchen Reno right now and I'm trying to decide what to do with the end panels. I see your perimeter end panels are plain. Are you happy with them? They look nice to me, and adding decorative end panels adds a good bit of cost, that I'm trying to avoid if I can. The kitchen progress is coming along awesome! I lovee it so far and wow what a difference adding the floor makes. 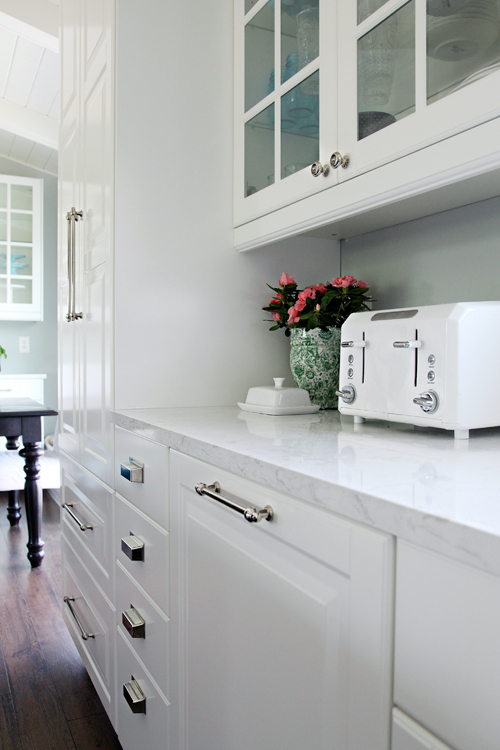 Those countertops I thought were marble, until you told otherwise they are fabulous and suit the space perfectly. Cant wait for more! LOVE IT AND YOUR LIVING ROOM! Have totally enjoyed following along to all your remodels :) Beautiful!!! Your kitchen reno is just lovely! Great use of the space. Tip for stainless cleaning. I found a couple of things work for me. Everyday wipe down with the Vinegar Windex and microfiber towel. For deep cleaning I use Bar Keepers Friend. I recently bought Zep stainless cleaner when we got a new fridge and it works great, but I found you need to spray it on a towel, not the fridge otherwise there is a lot of overspray on your floor and cabinets…. Hi Ann! The sink was ordered through our countertop company and they brought it and installed it the day the counters went in. I am not 100% sure of the brand, but I will see if I can find out. xo! I love the counter tops. Hi Jennifer, your kitchen is beautiful! I especially and loving the deep sink, will have to see if I can get a similar one in our budget. I'm also in the middle of a kitchen reno, two weeks down, two more to go (hopefully)!. Could you please tell me what colour is on your wall? I'd love to know...going crazy trying to pick a colour. Thanks so much! The color on our walls is Benjamin Moore's Quiet Moments. We did really love the faucet! I ended up receiving a gifted Delta faucet in a different finish and with touch 2.0 technology (auto on and off with a slight touch of the hand), so we swapped it out recently. But up until that we wouldn't have thought of changing it because we really did love it! It was easy to clean and the spray pressure was great.